So I check out Underwater Times from time to time to see whats new in the underwater news world. So when I happened upon this article from the United Arab Emirates, it reminded me of a Science paper that came out a few years back that is near and dear to my heart. But first, the news article. Essentially, sharks are a major fishery in the Arabian Gulf. From 1985 to 2000, shark landings in the UAE ranged from 1350 to 1900 tons of sharks, and the UAE is a major exporter of shark fins to Asia. However, scientists and fishermen alike have started to notice that the loss of shark predators has impacted the ecology of the Arabian Gulf. This has lead to a study to be undertaken examining these impacts. 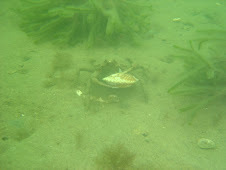 In the article, a sentence mentions how the loss of sharks on the Atlantic coasts has lead to a collapse in bay scallops. So you guessed right, this is where the 2007 Science paper which I find so particularly fascinating comes in. This paper, entitled "Cascading Effects of the Loss of Apex Predatory Sharks from a Coastal Ocean," by the late Ransom Myers and others detailed a study whose base conclusion was that the loss of sharks due to overfishing cascaded down the food web and resulted in the loss of bay scallops in North Carolina. They examined fisheries data for trends in individual species of elasmobranchs, the family of fishes to which sharks belong, from 1970-2005 between Cape Cod, MA and Cape Canaveral, FL. They were able to demonstrate strong decreasing trends in the abundance of great sharks, which are the apex predators. Over the same 35 year period, the populations of smaller elasmobranchs, including smaller sharks, skates and rays, were shown to be increasing. Many of these species, and the cownose ray in particular, are known consumers of benthic prey, including a variety of shellfish. In North Carolina, cownose rays move into the estuaries to feed in the summer, and were capable of removing entire bay scallop populations before they could spawn, and decimating populations to a point that densities were so low, that successful fertilization could not take place. By 2004, the North Carolina scallop fishery was gone. These mesopredators are also likely to be impacting the recovery of other shellfish species through consumption. Thus, the loss of sharks, even through by-catch, is likely to have devastating ecosystem impacts, not just in North Carolina, but likely in many coastal areas. (For other reasons why sharks matter, check out this website, this cool blog called Ya Like Dags, and the ongoing series of shark posts over on Southern Fried Science). Another paper that came out of the Charles Peterson group (he was a co-author on the above Science paper) investigated restoration options for scallops in North Carolina. Obviously, cownose rays still prevent a major problem. 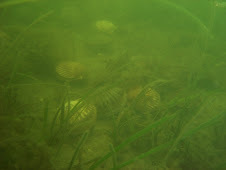 One mode of restoration they examined was a way to protect adult scallops in a spawner sanctuary from predation by the rays. 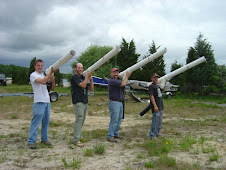 They were able to accomplish this via a fairly simple method of using PVC stakes into the sediment that reached out of the water at high tide, evenly spaced narrowly enough so that the rays could not fit inside. This method was capable of successfully maintaining dense populations of adult scallops during the period when the rays were in the estuary. Obviously, allowing populations of adults to survive to spawning is a major step in enhancing scallop populations. Thanks for the shout-out. The Myers et al. (2007) paper is actually controversial among shark experts, which surprised me. I think all shark experts agree on the fact that sharks play an extremely important regulatory role in the marine ecosystem though. Thanks. Not being in elasmobranch circles, I didn't realize there was such controversy around the Myers paper. As a scallop biologist, it made sense enough to me!